Whenever we travel we like to try and stay in a few of our smaller, regional towns. We are often more than pleasantly surprised with what they have to offer. On our recent trip south, we got a late start out of Brisbane so we were on the lookout for somewhere convenient to stop for the night. We checked our trusty Camps Australia Wide book and found that Millmerran had a free-camp so that’s where we headed. Millmerran is a small town located in the Darling Downs region of southern Queensland. A little over 200 kilometres south-west of Brisbane, Millmerran is the ideal spot to break up your trip when heading north or south. The Millmerran area was first settled in 1841 when the Gore brothers established Yandilla Station. The name Millmerran is believed to have been derived from two Aboriginal words – “meel” meaning eye and “merran” meaning to look out. Millmerran has a very active Historical Society. 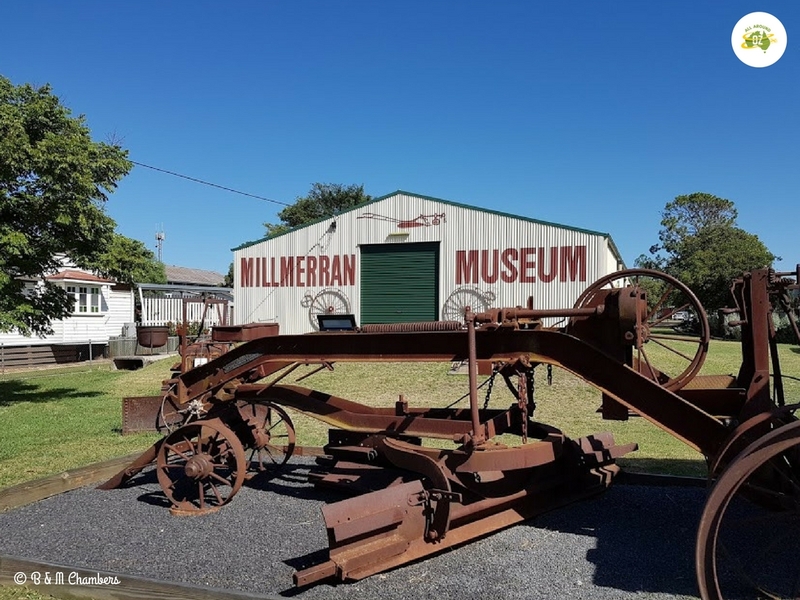 The Millmerran Museum houses an extensive collection of memorabilia from days gone by and is well worth a visit. Just at the side of the museum is the Millmerran Visitor Information Centre which is housed in an old railway building. 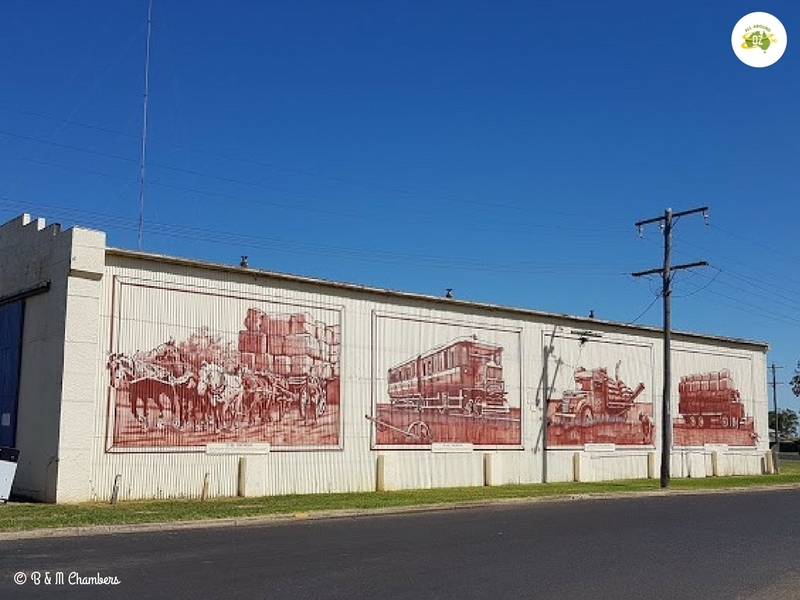 To learn more about the history of Millmerran you can follow the history walking trail around the town where you will be able to see some hisotric buildings that date back to the late 1800’s including St Joseph’s Convent and Passchandale House. The Millmerran Museum has a great display of historical items from around the area. The wider Millmerran area is a great place to go exploring. Millmerran is a strong agricultural area, with cropping and cattle the predominant activities. Yarramalong Weir is a popular spot for picnics and fishing and is only a short drive out of town. A drive out to Commodore Peak Lookout will give you views over the Millmerran Power Station, mine and surrounding farmland. Back in town, there are a number of murals which are worth looking at. These murals depict life in Millmerran in days gone by. These murals depict transport options from days gone by. Millmerran is perhaps best known for it’s Camp Oven Festival. Held every second year in October, this Festival has grown from very small beginnings to hosting thousands of people every time it is held. It is on our ‘bucket-list’ of things to do and we can’t wait to experience this event. The next Camp Oven Festival is due to be held on the 6th and 7th October, 2018. For more information you can visit the Festival website HERE. Millmerran has a couple of different accommodation options including a couple of motels. There are two caravan parks, with the Millmerran Village Caravan Park having cabins, motel rooms and van sites. It is spread out over 13 acres and located right on a lovely lake. Camping is also permitted at the Millmerran Showground, but for us, we loved our overnight stay in the free-camp at Walpole Park. Available to self-contained vehicles only and for a maximum stay of 72 hours, we thought this was the perfect spot to break up our journey. There are no showers or toilets available at this free-camp, but directly across the road is a dump point. We arrived a little bit to late into to town to have a meal anywhere, but the next morning I was in need of a coffee. I found a small coffee shop in the middle of the main street. Called Forage Kitchen & Coffee Bar they made a delicious cup of coffee and I also ended up adding a large piece of Lemon Sour Cream Cake (which was gluten free) to my order. With friendly staff and funky, 50’s style decor I would most definitely recommend a stop there. 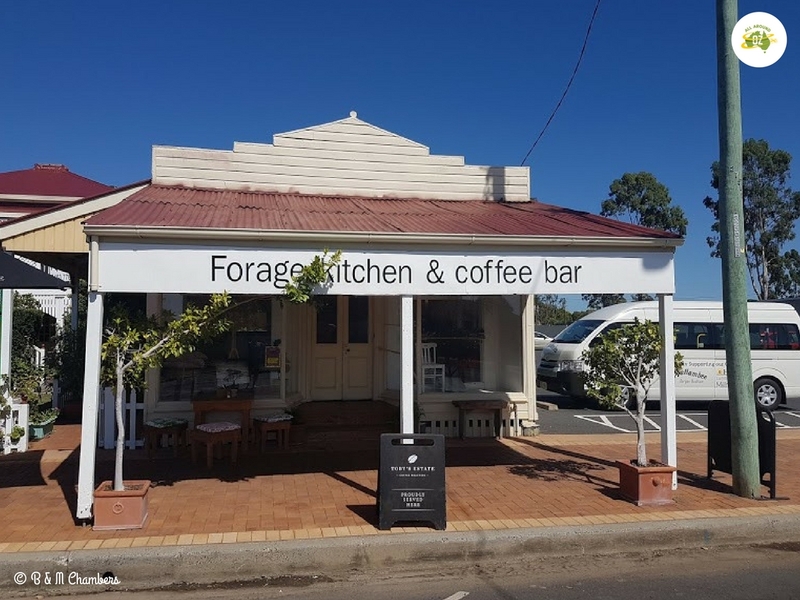 The coffee, cake and service were excellent at Forage Kitchen & Coffee Bar. 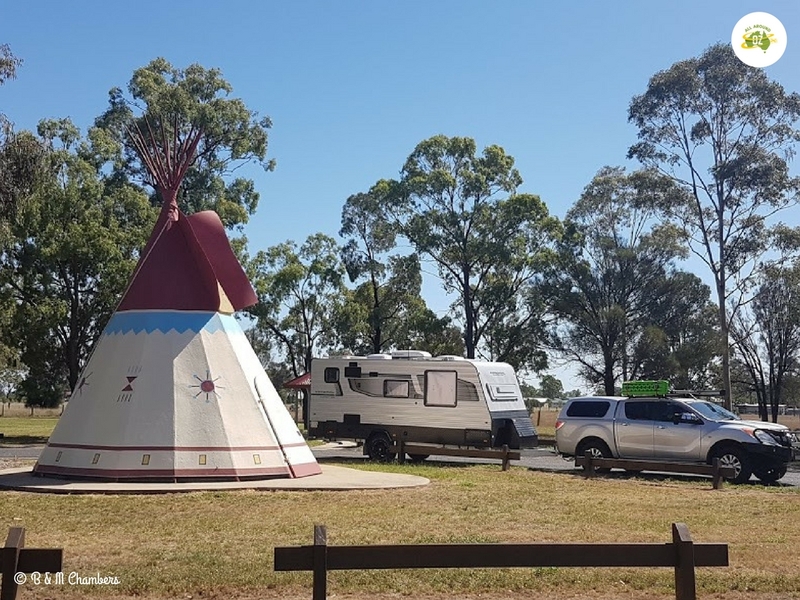 On our way out of town we couldn’t resist stopping at the Tepee in William Simmons Memorial Park which is apparently famous on ‘Snapchat’ and the Rendezvous Capital of Australia. For us, we just took a photo of the car and van! Apparently The Tepee in Millmerran is the Rendezvous Capital of Australia. I never knew there was such a thing as a camp oven festival! There are a few around but this one is a big deal. Can’t wait to see it.